Which Type of Virus Should I Use? Use this guide to learn more about the different types of viruses that are commonly used in research, and to find plasmids that can be used to engineer viruses for a wide array of research purposes. Ready-to-use viral preparations for select plasmids are now available through Addgene, learn more here. Visit these links to find plasmids that can be used to engineer various types of viruses. Lentivirus Lentiviruses are versatile tools because of their ability to transduce non-dividing cells. These viruses enable long-term stable gene expression and are permanently integrated into the host genome. Adeno-associated Virus (AAV) Adeno-associated viruses (AAVs) are commonly used for gene delivery in-vivo because of their mild immunogencity. These viruses can direct long-term transgene expression, but generally are not permanently integrated into the host genome. AAVs are limited by their small packaging capacity. Adenovirus Adenoviruses are commonly used as vaccines because of the strong immunogenic response they induce. Some (oncolytic) adenoviruses are utilized for cancer therapy because of their ability to preferentially infect and kill cancer cells. Adenoviruses have high transduction efficiency and direct high but transient transgene expression. γ-Retrovirus γ-retroviruses, commonly referred to as retroviruses, are the most popular virus for gene transfer in clinical trials. These viruses have a relatively high transduction efficiency, though this infectivity is limited to dividing cells. Retroviruses integrate permanently into the host genome, enabling long term transgene expression. While plasmids are typically used to encode, propagage, and manipulate genetic information, viruses are a powerful tool for the delivery of this genetic information to cells. Adapting plasmid DNA for use with virus-mediated delivery has many advantages for research. Viruses facilitate the delivery of genetic information to hard-to-transfect mammalian cells. In addition, "viral pseudotyping" can be used to target specific cells or tissues. Overall, viruses can efficiently get genetic material into a cell, and even deliver this genetic material to specific cells in an organism. Figure 1. Using viral plasmids to generate virus. 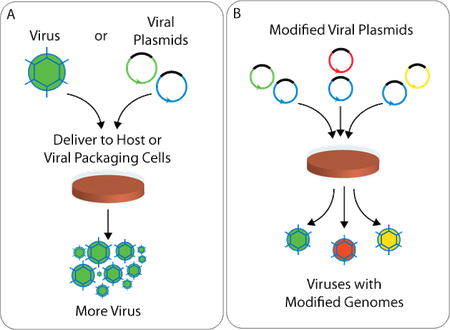 A) Viral plasmids have been engineered such that they can be delivered to a host and generate virus (right), similar to how natural viruses can be delivered to a host and generate virus (left). B) Viral plasmids can be modified for research purposes such that, when delivered to a host, they give rise to viruses with modified viral genomes. Naturally occuring viruses harbor genetic material (termed the viral genome) that, in general, encodes for more viruses. When a virus infects a host cell, its genome directs the production of more viruses. However, in theory, a viral genome could direct the host cell to produce other molecules or to express other genes. Viruses used to direct these alternate functions simply have to harbor alternate viral genomes, such that they no longer encode for more virus, but instead encode for a specific gene or other research interest. To produce viruses with alternate (non-virus-producing) genomes, naturally occuring viral genomes have been adapted into a plasmid-based technology, such that plasmids can be used to create viruses with specific genomes (Fig. 1A). In other words, instead of a virus infecting a host and giving rise to more virus (as happens in nature), researchers can introduce plasmids to a host to generate virus. Furthermore, these plasmids can be modified to give rise to viral genomes of choice (Fig. 1B). Thus, through standard plasmid cloning, viruses can be engineered to harbor a wide array of viral genomes, enabling researchers to direct a wide array of genetic functions in cells. For example, if there is a protein thought to be associated with better memory, plasmids can be used to create viruses that encode that protein. Then, those viruses can be used to deliver the "memory" gene (and thus, that protein) to the brain in mice and see if they are better able to remember how to solve a maze. These engineered viral genomes are also modified (relative to natural viruses) for safety through the removal of certain genes that are required for viral replication. Thus, as a safety feature, viruses used in research typically do not have the ability to propagate in the same way that naturally occuring viruses do. Instead, the genes that are required for viral replication are usually divided among many plasmids, such that all of these plasmids must be present for a viral particle or virion to be produced. Each of these plasmids, however, retains the properties of any typical plasmid and thus can be easily modified and amplified (through standard cloning methods). There are different types of viruses that are commonly used for research, each of which exhibit different properties, and thus, are suited for specific research goals. For example, adeno-associated virus (AAV) is typically preferred for in-vivo studies because of its low immunogenicity. Different types of viruses also vary in the composition of their viral genome, with some having an RNA genome while others have a DNA genome. In addition, some viruses function by permanently integrating into the host's genome (which is suitable for long term studies) while other viruses are temporary in the host. Use this guide to learn more about the different types of viruses that are commonly used in research, and to find plasmids that can be used to engineer viruses for a wide array of research purposes. This table provides a brief overview of the properties of different types of viruses. More detailed information can be found in the guides for each virus type, linked above. * Recombinant AAV has a low frequency of target cell genome integration. For providing scientific review of our viral pages, we thank Boston Children's Hospital Viral Core. The NIH provides basic guidelines for working with various types of viruses; however, these guidelines may differ depending on the insert type and envelope used. Please consult with your institution’s Biosafety Committee before beginning virus work. For general virus biosafety guidelines, check out Addgene's Biosafety Resource Guide.